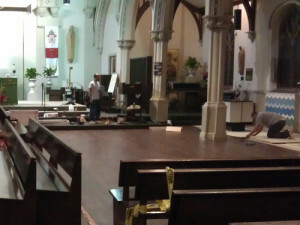 A busy 1890s church in downtown White Plains had frayed carpet and a badly failing 1960s vinyl tile floor. Products: Low but dense looped pile carpet to hide wear: first in a deep green, then in gradually lightening greys on steps up to the altar. 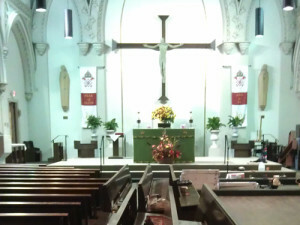 Oak-grained VCT in generous 6” x 48” planks had a hand-hewn look that complimented the buildings’ vintage and scale, as well as the original dark oak pews. VCT is durable, safe, easy to maintain; kept install costs down and aided acoustics. Logistics: Good communication and good people, made it happen. 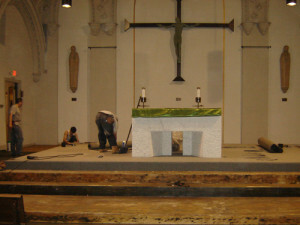 A schedule was set and followed, and this experienced crew worked overnights, in sections, removing the old, making repairs and installing the new, leaving the church re-assembled and debris-free each morning in time for early mass. 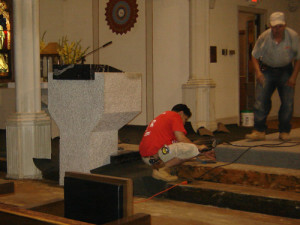 The flooring in our large church needed to be replaced, but without shutting the building for a single day. Marie showed us good options and set a plan that both respected and enhanced our sacred space. Integrated with her talents is her knowledge of good people who work on each project, ever attentive to detail. Our crew kept to schedule, with no interruption to our services. Marie Graham and I share the same last name, and although we are not related, Marie treated us like family.